ONLY FEW MINUTES AWAY TO SHINJUKU!!! Nakanoshimbashi is famous for Sumo wrestler and Comedians! 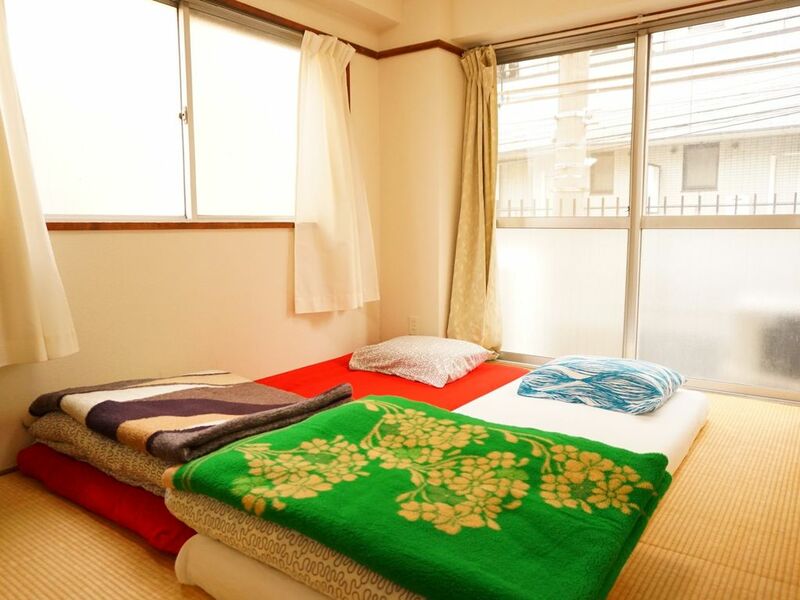 Nice area with river and convenient access both Shibuya, Shinjuku and also Chuo line, like Nakano, Koenji, Ogikubo! 2 minutes walk from Nakano-shimbashi station and just 10 minutes to Shinjuku by train. This apartment has spacious bedroom. It accommodates 3 people. With own kitchen, shower room and toilet. It also has a balcony where you can hang your clothes to dry. Washer is provided free to use. The room is on the 2nd floor and you may have to climb stairs. Extra fees will apply for early check-in and late check-out. Please contact us in advance. My brother and I stayed for 5 nights. Loved the location -- Nakanoshimbashi feels like a neighborhood, a place where people live. Lots of restaurants and conveniences close to the Metro, and the apartment itself is only about a 5 minute walk. Shinjuku is close, if you use the Metro; walkable in about 30-45 minutes. The bedrooms are spacious -- could easily accommodate 3 with luggage, but 4 with luggage might be tight. One room overlooks the Kanda river and is very quiet; the other faces the street. The kitchen is tiny: you could cook, but there isn't much room to sit/dine. But, this is Tokyo ... eat out! Bathroom is fine, but as another guest wrote, it could use a deep scrub and bleaching. Didn't really see the "balcony." Overall, a great value, great location, and Travelmob (and Luke) were very helpful. Gave a slightly lower rating for accuracy simply because we were not prepared for how small the kitchen really is. Three of us stayed here and it was tiny, expected for Tokyo and the price I guess. The dining room table was more of a TV tray and the kitchen was so small that we didn’t use it (we like to cook breakfast). The bathroom/shower could use some deep scrubbing. Overall it was a pleasant stay. We stayed here for the weekend with our friends (4 people total). It was perfect for what we needed. We stayed here for the weekend with our friends (4 people total). It was perfect for what we needed. Super close to the subway station and easy to get everywhere. Very clean and comfortable. Ho pernottato in questo appartamento per 5 notti assieme a mio fratello. Dall'esterno potrebbe sembrare sgradevole, ma è solo apparenza. questo appartamento è perfetto per i viaggiatori, lo spazio è stretto e indispensabile ma pulito e ben equipaggiato. Il personale è disponibile e discreto.